Launched in March and already one of our fastest selling supplement. 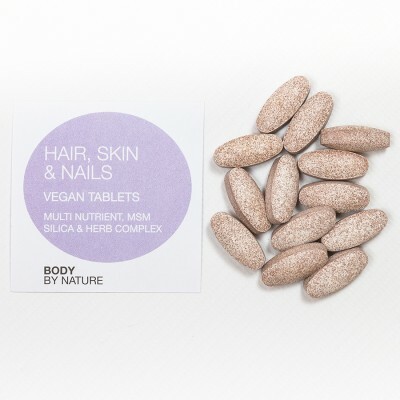 This supplement contains a carefully selected blend of natural nutrients all of which play a specific and beneficial role in supporting the structure, quality, growth and condition of your hair, skin and nails. For maximum benefits to skin, hair and nails at development and growth stages we need to ensure optimum nutrition. Is an important mineral and antioxidant, with confirmed health benefits for selenium including contributing to the maintenance of normal hair and nails and to the protection of cells from oxidative stress. Is an important vitamin and antioxidant with a wide range of health benefits. Vitamin C contributes to collagen formation; the normal function of blood vessels and skin; and to the protection of cells from oxidative stress. Has a veriety of functions in human health including a role in the process of cell division. Zinc also contributes to the maintenance of normal hair, nails and skin and to the protection of cells from oxidative stress. Is a water soluble B-complex vitamin, an important co-enzyme and essential nutrient that contributes to the maintenance of normal hair and skin. Is a mineral essential for the formation of the pigment melanin which plays a role in the pigmentation of the hair, skin, and eyes. Copper contributes to the maintenance of normal connective tissues, normal hair and skin pigmentation and to the protection of cells from oxidative stress. Intake of oral selenium plus copper is also associated with protective factors in respect of sunburn cell formation in human skin. (Methyl sulphonyl methane) is an organic form of sulphur; high levels of sulphur are found in the muscles, skin and bones as well as concentrated amounts in the hair and nails. Sulphur is a component of keratin, the main protein of hair and nails and is vital for the formation of keratin, collagen and elastin which provides flexibility, tone and strength to muscles, bones, joints, skin, hair and nails. Extract is important for the human body with its role in the normal formation, growth and development of bone, connective tissues and cartilage. 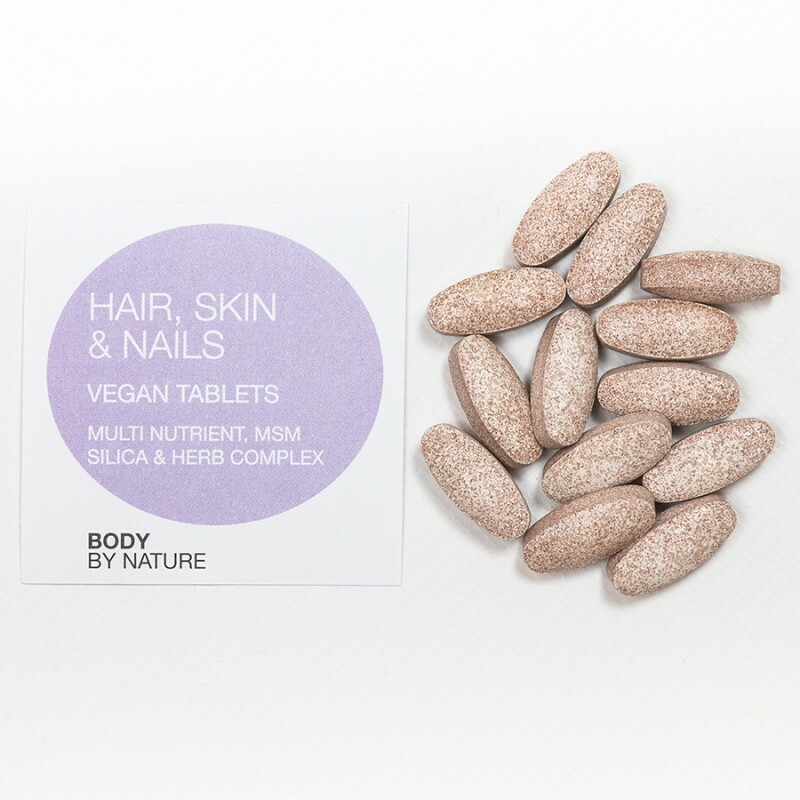 Silica is concentrated in all connective tissue including nails, hair and skin, where it contributes to collagen formation. Is a water-soluble vitamin and is important for the maintenance and repair of all cells and tissue. It is considered beneficial in the maintenance of healthy skin, muscles and nerves with reported benefits for pantothenic acid and acne appearing very promising. Is a natural plant extract rich in the flavonoid procyanidins and considered to provide beneficial antioxidants which research has confirmed as inhibitory to the damaging free radicals and hence beneficial to skin. As well as having a function toward skeletal health plays a recognised part in the process of cell division and specialisation. There are several forms of calcium available, natural wholefood calcium sourced from seaweed is provided in this supplement. 1 or 2 tablets daily, or take as directed by a practitioner. Suitable for: Vegetarians and for people with Candida and yeast sensitivities. Non GM & Free From: Wheat; starch, gluten; lactose; soy; added sugars, colourings, flavourings and preservatives. Storage: Keep cool, dry and out of direct sunlight. Methylsulphonyl methane (MSM), lithothamnium calcareum (providing calcium & iodine), ascorbic acid, pine bark extract, horsetail extract, calcium pantothenate, hydroxyproplmethylcellulose, mineral enhanced yeast providing selenium, zinc citrate dihydrate, silicon dioxide, cupric sulphate anhydrous, and d-biotin.